Most recently, each time I drive to the post office (or in that general direction), I am so impressed with the Justice Center on Austin Street with the adjoining parking garage (and walking bridge from the garage to the Justice Center). What a difference this has made with downtown parking! The other day, Hubby was in the garage and counted 42 parked cars – which means several downtown parking spots were available for business customers. How sweet it is!! The Koehler Company certainly built a handsome Center and parking garage. A great addition to Seguin. There is daily progress with the Walnut Branch project and I love walking down there to see what is happening and envision what Will Be! TXDOT has announced that Seguin’s Walnut Branch Park will be getting nearly 2-million dollars in funds to help build a hike and bike trail for that park. That was part of TXDOT’s announcement this week of 54 transportation-related projects across the state that will be getting a total of 76-million dollars. The 1.9-million going to Seguin represents 80% of the cost of the 2.4-million dollar Walnut Branch Park project, with the City of Seguin providing the other 20% of funds. The hike and bike trail will run from Hwy 78 south along Walnut Branch to Convent Street and will incorporate plans already approved for the park on the north side of Seguin as well as the work currently underway between Court and Nolte Streets. Also included is a 14-foot wide trail, complete with fencing, railing, retaining walls, boardwalks, and a footbridge to be installed at the creek at Convent Street. And TXDOT’s funding is for work that goes beyond the roughly 5-million dollars that the US Army Corp of Engineers has requested for the design and construction of the waterway between Hwy 78 to Starcke Park. There are many great things happening in Seguin these days and Neice Bell’s article in today’s Seguin Gazette Enterprise says it quite well. 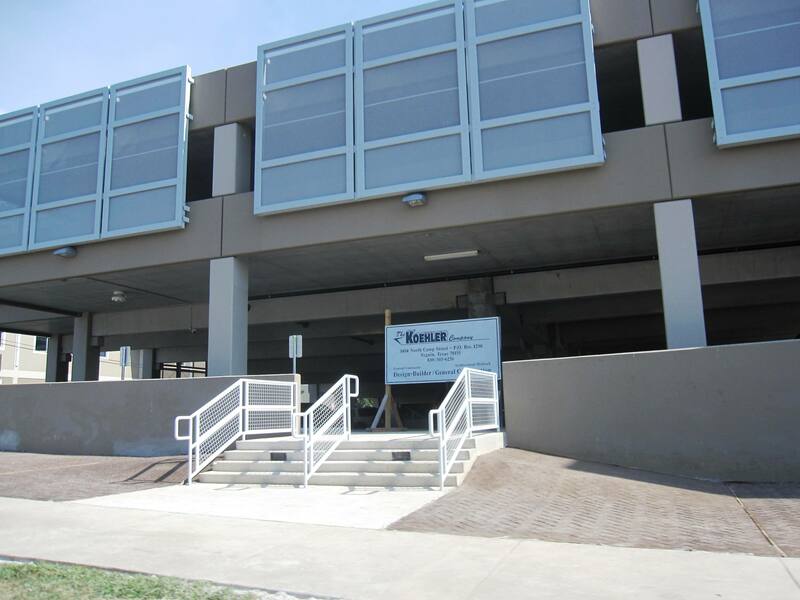 The Justice Center parking garage is open to the public - and open for business! Posted in Seguin Texas and tagged business, Justice Center, Koehler Company, Neice Bell, Parking, Seguin Gazette Enterprise, Seguin Texas. Bookmark the permalink.